Rotary supports the education and development of young people and, along with other clubs in our District, the RCC is actively involved. In association with other local Rotary Clubs, we support ‘Youth Speaks’, an annual event in which students from local schools are invited to take part in organised debates. Teams fall into two categories: the Intermediate, of 11-13 year olds and the Seniors, of 14-17 year olds. Four successive stages are organized: local, district, regional and national. This year the venue and dates for the local event will be the Royal Russell School, for Intermediates on 9th November and for Seniors on 16thNovember. About 30 local schools are being invited to take part. 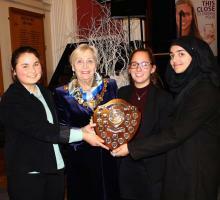 The mayor of Croydon will present prizes to the winning teams. The RCC also supports financially two local students from one school each year on the Rotary Youth Leadership Award scheme. The students are selected by the school, with the advice of the Rotary Club, and join some 50 or more students from a variety of schools in the District. They spend a week at the High Ashurst Outdoor Activity Centre on Box Hill near Dorking where they take part in a variety of team building and sports activities designed to develop personal self- confidence and self-esteem, improve leadership skills by working with other young people of the same age and interests. Nationally, Rotary supports a variety of competitions, such as Young Chef, Young Photographer or Young Writer and helps to organize technology tournaments. The success of such initiatives depends on having fruitful contacts with the schools. Suggestions for such activities can at any time be discussed with the Youth Services Officer for consideration by the council. 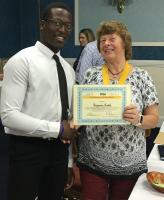 Benjamin Fadele who successful completed the RYLA course. Students discuss the case for 'leaving' or remaining'. "One of the best experiences of my life."